This page is dedicated mainly to educating lake residents about the various invasive species that have either already invaded Eagle Lake, or that threaten to pose problems to the lake in the future. This includes Eurasian Water milfoil, Zebra Mussels, Purple Loosestrife, and are not limited to strictly aquatic invasive's. Articles About Invasives Page- Various newspaper articles and publications that have focused on the plight of local lake associations and residents as they battle against invasives species of one type or another. Most of the articles come from local area news publications in the Adirondack region. Clean Drain Dry Page- Information about the new initiative to clean and dry your boat, remove invasives, and drain bilge water before entering a new body of water. Curly Leaf Pondweed Page- Communications regarding plant identification and follow up discussions on possible removal methodologies. Lake Management Planning Guides Page- General guides to forming a lake management plan as well as management alternatives on other lakes. Plant Identification Page- Provides resources to help with aquatic/terestrial and native/invasive plant identification. Plant Surveys (Eagle Lake) Page- Surveys of Eagle Lake that studied either individually or in combination the location and distribution of native vegetation or the locations and distributions of the invasive Eurasian Water Milfoil. The U.S. Forest Service announced on Monday, December 5, 2011, the publication of its first-ever national-level direction on the management of invasive species across aquatic and terrestrial areas of the National Forest System. This site has a robust amount of information related to all types of invasive species and how the Federal Government is trying to address them. Milfoil is an attractive plant with feathery underwater foliage. It was once commonly sold as an aquarium plant. Accidentally introduced to North America from Europe, it spread westward into inland lakes and streams, primarily attributed to being carried by boats and boat trailers, with some spreading caused by water birds. In nutrient-rich lakes, it can form thick underwater stands of tangled stems and vast mats of vegetation at the water's surface. In shallow areas, the plant can interfere with water recreation. The plant's floating canopy can also crowd out important native water plants. Plants grow well in 3-20 feet of water and often have plant stems as long as 20 feet. The introduction of milfoil can drastically alter a water body's ecology. Milfoil forms very dense mats of vegetation on the surface of the water. These mats interfere with recreational activities such as swimming, fishing, water skiing, and boating. The sheer mass of plants can cause flooding and the stagnant mats can create good habitat for mosquitoes. Milfoil mats can rob oxygen from the water by preventing the wind from mixing and oxygenating surface waters. The dense mats of vegetation can also increase the sedimentation rate by trapping sediments. Milfoil also starts spring growth sooner than native aquatic plants and can shade out these beneficial plants. When milfoil invades new territory, typically the species diversity of native aquatic plants declines. While some species of waterfowl will eat milfoil, it is not considered to be a good food source. Milfoil reproduces extremely rapidly and can infest an entire lake within two years of introduction to the system. Although milfoil produces many seeds, we do not believe that these seeds are important for milfoil reproduction in Washington waters. However, milfoil is able to reproduce very successfully and rapidly through the formation of plant fragments. In the late summer and fall the plants become brittle and naturally break apart. These fragments will float to other areas, sink, and start new plants. Milfoil will also grow from fragments created by boaters or other disturbances during any time of year. A new plant can start from a tiny piece of a milfoil plant. This is why milfoil can so easily be transported from lake to lake on boat trailers or fishing gear. Once established in its new home, water currents may carry milfoil fragments and start new colonies within the same water body. Talk by many community member and lake representatives has indicated that the presence of milfoil affects property values. A recent study concerning real effects on Vermont property values can be found here. Economic Impact Survey of Eurasian Watermilfoil Removal from Houghton Lake. The real effects on Property Values. Once milfoil becomes well-established within a water body, it is difficult or impossible to remove. There are many techniques that have been employed to control it these include hand pulling, benthic bottom barriers, mechanical harvesting, diver operated suction dredging, "rotovation" biological controls, and select herbicides. Each method has its' advantages and disadvantages for a full discussion of lake management see the link to our lake management page below. Lake Management Plans (Eagle Lake) Page- a brief synopsis of the more viable milfoil control methodologies (including benthic barriers, herbicide, hand/mechanical harvesting, etc.) as outlined in the ENSR Supplemental Environmental Impact Statement for Eagle Lake. Adequate public notification and signs about milfoil and other potential aquatic invasive species, is crucial to stopping the spread. Here are examples of effective and ineffective warnings concerning milfoil. Left to right: New Hampshire, New York, and Vermont. Michael R. Martin, Certified Lake Manager, President of Cedar Eden Environmental, observed that the VT and NH signs were quite clear in asking visitors to help stop the spreading. The NY sign, however, besides being visually uncompelling, also seems to indicate that "...Eurasian milfoil can be dispersed by fragments and tiny seeds that can remain undetected by the most concerned lake user." This seems to be saying that the lake user shouldn't bother checking for the "invisible" milfoil. Eurasian milfoil is almost exclusively spread by fragments, and the fragment has to include a leaf node (stem with leaf attached), meaning it most likely will be 1/2 inch to 1 inch in size AT A MINIMUM. NYS in 2008 posted new signs at some Adirondack lakes that indicate "You are entering an infested lake" but fails to mention what the infestation is or what one should do either before entering the lake or when leaving and taking boats and equipment elsewhere. Acentria ephemerella is a moth in the family Pyralidae. It is native to Europe and Asia but was inadvertently introduced to North America in the 1920's. Adults can fly, however most females are flightless and stay on the water surface where they breed with flying males. The larvae (caterpillars) feed on an array of aquatic macrophytes. However they do have a high preference for and consumption rate of Eurasian water milfoil (Buckingham and Ross 1981). In 2000, several samples of Eagle Lake milfoil were sent to Dr. Bob Johnson, Cornell University, for analysis for the presence of herbivores. Upon examination, Dr. Johnson reported that the samples contained “a significant population of both Acentria moths and weevils”. In a follow-up sampling by Dr. Johnson in early July 2001 on Eagle Lake, he reported finding only a very limited evidence of either moths or weevils. Triploid Grass Carp- Triploid grass carp are plant-eating fish from the Amur River Basin and lowland rivers in China and Russia. Grass carp are generally not recommended for milfoil control because milfoil is not a highly preferred food. As a result, the concern is that they can enhance milfoil growth by removing competition from native plants and opening up more area for milfoil to colonize. In Washington state, grass carp can be used for milfoil eradication/control only in water bodies where the eradication of ALL submersed aquatic plants can be tolerated. Research on Herbivore's effect on milfoil: 2000 Johnson et. al "Experimental evidence for changes in submersed macrophyte species composition caused by the herbivore Acentria ephemeralla (Lepidoptera)"
Bob Johnson Herbivore Study: 2000 Johnson et. al "Eurasian Watermilfoil Biomass Associated with Insect Herbivores in New York"
Eurasian Watermilfoil- facts and herbivore activity in NY by NYS Seagrant Bob Johnson and Bern Blossey article. Lake Management and The Milfoil Solution Lake Bonaparte- 182,000 milfoilweevils were stocked 2002-2008 for an average of 26,000 weevils per year, EnviroScience Inc.
Adirondack Park Invasive Plant Program (APIPP)- 2010 Annual Report for aquatic and terrestial work indicates that 80 lakes in the park have been identified with milfoil. This is 6 more than were know in 2009 and 53 more than in 2001 when formal surveys were started. Lake Cochituate (MA) A wealth of information about treatment options- what they have tried to get approved. Lake George (MI) Lake George Aquatic Concerns, focusing mainly on the process they are undertaking to remove milfoil from the lake 2006. Zebra mussels are small, brown-and-white-striped clam-like animals that pose a serious threat to our fisheries and other water users. They have been found as far west as Thunder Bay and could spread rapidly into our waters if steps are not taken now. Native to the Caspian and Black seas of Eastern Europe, the mussels were first spotted in Lake St. Clair in 1988, apparently brought from Europe in the ballast water of a freighter. They have since spread to all of the Great Lakes. The fingernail-sized mussels attach themselves to the intake pipes of municipal water supply systems and power plants, sharply reducing flows. 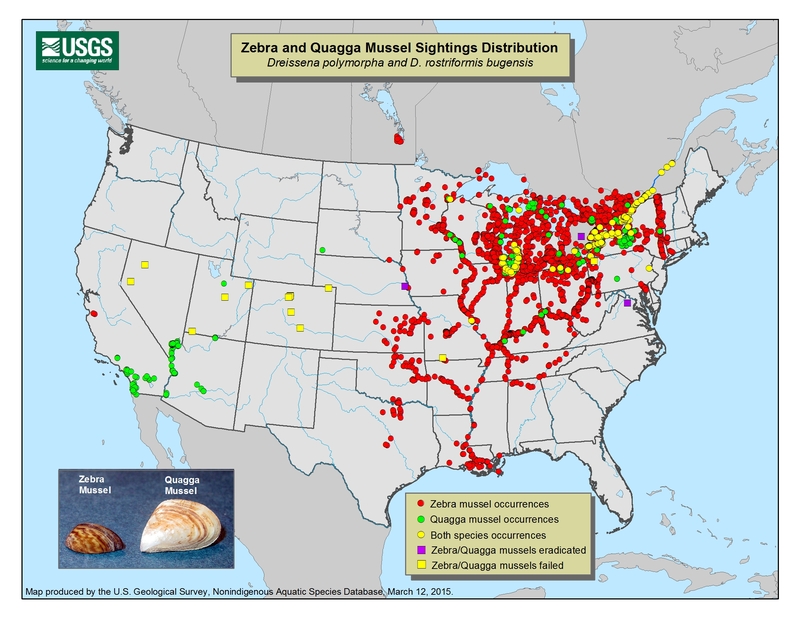 Zebra mussels cling to rocks, reefs, fishing nets, piers, buoys, and even other creatures such as clams and crayfish. Capable of forming colonies of up to 700,000 mussels per square meter, over 15 centimeters deep, they quickly cover fish spawning beds. They compete with fish by consuming large quantities of plankton, a very important link in the aquatic food chain. In the United States, mussels forced a Michigan hospital to dismiss patients and cancel elective surgery, hiked Detroit Edison's annual maintenance bill by $500,000 a year, and threatened boaters on Lake Erie by sinking navigation markers. Asian Clams are a relative of Zebra Mussels. NY Invasive Species Clearinghouse- peer-reviewed article Asian clam (Corbicula fluminea) species profile; new Clearinghouse educational materials, including a tri-fold brochure and a four-page fact sheet will be available on NYIS.INFO in the near future. Acid rain is rain that is more acidic than normal. Acid rain is a complicated problem. Caused by air pollution, acid rain's spread and damage involves weather, chemistry, soil, and the life cycles of plants and animals on the land and from acid rain in the water. Invasive's of All Types on the Move!!! In the Fall of 2004 a concerned Officer of the ELPOI became involved with the NYS Governors Task Force for Invasive's. This involvement lead to a heightened awareness for invasive's in general as they threaten NY, specifically the Adirondacks and Eagle Lake. In the time that the Task Force took to conduct its research on invasive's and write their final report; six new invasive organisms were found in NYS. Listed below are links and documents that describe but a few of the over 100 plus invasive's that threaten all parts of New York State. These invasive's are on a march from an area near you to your favorite “natural spot of beauty”. Practicing prudent environmental education and cautions as we move ourselves and our possessions (boats/ trailer, fishing gear, cars, building materials, gardening supplies, fire wood etc.) around can help prevent/ slow the spread of these invaders. It will be to all of our advantages to be part of an early detection and “rapid response” (removal) plan for these invaders as opposed to the often very costly, often times impossible and environmentally damaging process of eradicating a large infestation. Adirondack Park Invasive Plant Program (APIPP) Map and searchable data base for lakes in the Adirondack Park with Invasive's. COLAM's Report on Eurasian Watermilfoil February 1992: First Discovery, what is it, why it's a threat, what's been done, current distribution, costs associated with removal, local economic impact, who pays the bill, recommendations, letter to governor asking for help, permit streamlining letter to APA, youth drowning article. This section focuses primarily on the terrestrial invasive's that are either threatening the lake community and have been spotted nearby, or that will be threatening us directly in the next few years; as well as those invasive's that are sadly already in the Eagle Lake area. Report Invasive Beatles in NYS- You can help us stop the spread of the beetles and the devestation to our forests, parks, and neighborhoods by searching your community for signs of the beetles. 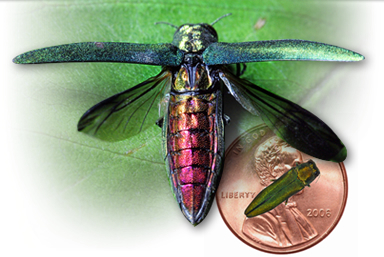 Emerald Ash Borer Information Page- Here you will find information pertaining to the Emerald Ash Borer( Agrilus planipennis) and it's spread across the New York and the United States. It is an invasive winged insect that as its' name implies attacks ash trees in many instances killing them. This invasive can be managed through proper arboricultural treatments given sufficient lead time before the Emerald Ash Borer attacks your trees! Giant Hogweed Fact Sheet Bugs Fight Bugs- Hope to protect hemlocks from the Hemlock Wooly Adelgid USDA forest service 12-17-2010. Fall/Winter 2010 Roots- See page 2 for an article about the invasive European Oak borer. Asian Longhorned Beetle- The threat in black and white TCIA Magazine 4-2012. Wild Boars Invade The North Country- Wild pigs cause thousands in damage and are hard to catch. Ben Tabor (NYSDEC region 5) interviewed by news channel 5 (WPTZ). Wily, Elusive Foragers Invade Upstate New York- New York Times article on feral swine 3-11-2012. This section deals mainly those efforts that represent a concerted effort to deal with invasive's. If you are looking for more information on individual lakes efforts look at our Milfoil Project Page for Eagle Lakes efforts to date, or try our Aquatic Invaders section for information on other lakes efforts. Washington State Department of Ecology Web site A great overview of aquatic herbicides for plant management including modes of uptake, herbicides available, advantages and disadvantages, basic cost comparisons, and links to environmental impact statements. Herbicide Information Page- general and specific information about two of the herbicides (Renovate and Sonar) that are NYS registered for the control of milfoil. MSDS, Product Labels, Environmental Impact Statements, FAQ's, etc. Pre and Post Treatment Plant Survey Page- a compilation of documents that have been found on the internet or provided by applicators or lake managers related to the application of the herbicide Renovate. Invasive Species Task Force Page- Detailed information about Eagle Lake's involvement with the Invasive Species Task Force. Turbidity Curtains Page- Information related to materials, costs, deployments, and accessories that can be used for creating a lake within a lake. Curtain Containment Leakage Testing Page- Proposals and materials for determining water exchange rates in curtain contained areas. This section is a limited collection of videos on invasive species. Most of the videos below focus on Eurasian Water milfoil and its' control. Milfoil in Eagle Lake Video Page- 2006 video documenting an in the water view of the milfoil problem at select locations in Eagle Lake. Milfoil Patch Swim Around Video Page- 2008 video that is designed to be an educational tool to illustrate just how much of a problem the milfoil is in Eagle Lake, as well as to illustrate the dense mono cultures that exsist in the lake. Didymo Algae Video- progression of algae in a "fine tailwater trout fishery in MD and well worth the time to watch (~25 min)." Why Aquatic Herbicides Affect Aquatic Plants and Not You!- Good descriptive video of aquatic plant types (monocot vs dicot) and herbicide action related to nuisance plant control. This morning we are pleased to announce the NYinvasives Channel on YouTube where all past presentations from our NY Invasive Species Speaker Series are now available. Visit youtube.com/NYinvasives and become a subscriber. Subscribers will be alerted as new material is posted. The posted presentations only contain the featured presentation - the PRISM round-robin and Q&A will still be available via the recorded WebEx link for those who want to hear a call in its entirety. Please share the NYinvasives YouTube Channel link with your partners and invite them to learn more about the great work being done in New York to combat invasive species. This section focuses primarily on those species that while native to the Adirondack region, still have a negative environmental impact in large numbers, or that interfere with the maintenance and use of the Eagle Lake watershed. This section focuses on the issues that affect the quality of fishing in Eagle Lake. It also focuses any health risks that may be associated with eating fish caught in the Adirondacks in general. No specific restrictions currently apply to Eagle Lake. Boater Safety Information- This page includes publications about the "rules of the road" and polite use of recreational watercraft on Eagle Lake and other navigable inland waterways. 30" Brown Trout- Caught through the ice, winter of 2012. Protecting Hamilton County from Spiny Water Flea- 8-10-2011 Adirondack Almanack article about the invasive, it's impact on fishing, and steps you can do to stop it's spread. Invasive Species? It won't happen to me- Times of Ti Joe Hackett opinion for taking responsibility for cleaning ones own personal fishing gear (10-2010). Sportsmans Connection write up and review of fishing in Eagle Lake (10-1-2010). Where do Fish Really go in Winter? Observations from New York waters. Currently located at several locations in Lake George.